What is Compete Club Management? 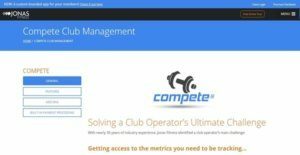 Compete Club Management is a scalable and easy-to-use club management platform that helps club owners and operators in the health, fitness and wellness industry improve the operational efficiency of their business, increase member satisfaction, reduce employee training costs, access key metrics related to club performance, and boost profitability. The platform is developed by Jonas Fitness, a software company that provides leading enterprise fitness software solutions, billing systems, and management tools to various industries across the United States and Canada. Furthermore, Compete Club Management is designed to ensure that club owners and operators will be able to utilize and maximize their software technology investments, wherein they no longer need to purchase expensive software solutions in the future just to maintain the smooth operations of their club. Compete Club Management offers a feature-rich front desk system that enables club staff to check in clients, guests, and prospects; collect payments, manage bookings, access member and service agreements, and track their worked hours. With these front desk features, club owners and operators can reduce the costs associated with training their employees, and at the same time, employees can do their tasks faster. Compete Club Management also has comprehensive back office features that assist users in obtaining in-depth insights into how their clubs operate. They will be able to monitor payment collection, set up and assign roles to employees, manage multiple clubs in one solution, and offer various types of payment options and billings to clients. Last but not least, the platform delivers integration capabilities which facilitate and optimize the process of connecting to third-party apps and services and gathering data, producing reports for analysis, as well as managing commissions. Health clubs, gyms, and wellness centers can take advantage of one the efficient and reliable features offered by Compete Club Management. This feature is its intuitive web-based front desk system. Front desk staff will surely love this system, as they will be able to easily learn how to use it, thereby reducing employee training costs. Supporting a full touchscreen capability, the front desk system can seamlessly work with hardware devices and peripherals that are connected to it such as bar code readers, cash registers, fingerprint scanners, cameras, and POS poles. The system is also equipped with a role-based security feature wherein employees can only access and use the functionalities of the system that are assigned to them based on their roles. Compete Club Management has a front desk check-in feature. With this feature, front desk staff can quickly register and log in the members of the club as they show up for their classes, sessions, or appointments. They can also check in families, children, guests, and prospects. During the check-in process, they will be able alerted on important information such as when the member has not yet paid his or her past due balance. Likewise, they can view all the appointments of the person they are checking in. The club management provides a booking functionality which integrates with its check-in feature. This functionality enables club staff to create and manage schedules for classes, sessions, and appointments. What’s great about this is that as they prepare schedules for classes, it eliminates the possibility of double booking of shared resources, wherein materials or equipment are reserved to the same clients at the same time. When classes or courses are overbooked, users can access a list where they can easily track and handle those standby clients who are waiting for their turn. If a client decided to cancel a scheduled session, class, or appointment, the platform also helps them manage such scenario. In case they need to book multiple members and groups all at once, Compete Club Management permits them to do that. As part of its front desk features, Compete Club Management is built with a point-of-sale system which allows users to sell products, and service and session packages or plans to clients and prospects. They will be able to create different categories of products and utilize product buttons so that transactions are processed faster. The system enables clients to make payments based on any payment option they prefer. When they send their payments via their credit card, users will be able to receive an authorization from the bank that issued the card in real time. If they want to offer discounts or have their clients redeem gift cards, the system makes that possible too. Compete Club Management provides users with the capability to prepare electronic member agreements for the plans or packages that clients are availing or subscribing to. As they create agreements they will be able to include all the associated services and contracts in the agreements such as those related to club membership, personal training, and locker and towel. With Compete Club Management, they can create any type of contract they need. This is because the platform comes with various built-in contract templates. In addition, they have the option to set up any billing cycle and payment method they prefer for each agreement. Signing agreements electronically is made possible using the platform. Interestingly, it ensures that no one can make modifications in the agreement while clients are signing or after the agreement has already been signed. With Compete Club Management, tracking key processes in club operations is a breeze. It delivers robust back office features that permit comprehensive and detailed monitoring of club administration, payment collection, and billing. For instance, it enables club owners and operators to have a closer look at how payments are being collected and processed. They can assess if their payment collection is hitting the goal they set. When changes are applied to members’ accounts, the platform updates the changes in real time. Another back office feature available in Compete Club Management is it provides users with the ability to set up, configure, and handle multiple clubs within a single tool. As they manage multiple clubs, they can assign roles that are specific to each club. Because of this, only authorized employees can access certain data. They can also create different groups within a club so that it will be much easier for them to define and assign roles to their employees. Compete Club Management has data integration features that enable users to access member data from third-party programs and systems that are connected with each other. This is made possible by the platform’s API/web service interface which can be integrated with various third-party applications and tools. Also, member data can be exported to third-party accounting solutions. The club management platform can generate various types of reports so that club owners and operators can track and evaluate the performance of their clubs. With such reports, trends that affect how clubs are being used and how clubs generate revenue are identified. In addition, each report provided by the platform has multiple sort and select options, letting users filter and explore important data with flexibility. Compete Club Management comes with commissions management features. As an example, users can set up commission amounts based on different tiers or levels such as the sales amount or the number of sales the employees are generating. If they want to access reports on the commissions made by each salesperson in the club, the platform can also produce that. If you are interested in Compete Club Management it might also be beneficial to check out other subcategories of Best Club Management Software gathered in our database of B2B software reviews. Since each company has specific business requirements, it is sensible for them to abstain from looking for a one-size-fits-all perfect software solution. Needless to say, it would be pointless to try to find such a platform even among market-leading software applications. The intelligent thing to do would be to jot down the various important factors that require consideration such as required features, budget, skill levels of staff members, company size etc. Then, you should do your homework thoroughly. Read some Compete Club Management reviews and look into each of the other systems in your shortlist in detail. Such exhaustive homework can make certain you weed out ill-fitting applications and zero in on the solution that presents all the elements you need for business success. How Much Does Compete Club Management Cost? Compete Club Management’s SMB and enterprise pricing plan information is available only upon request. Please contact the vendor, and ask for a quote. We realize that when you make a decision to buy Club Management Software it’s important not only to see how experts evaluate it in their reviews, but also to find out if the real people and companies that buy it are actually satisfied with the product. That’s why we’ve created our behavior-based Customer Satisfaction Algorithm™ that gathers customer reviews, comments and Compete Club Management reviews across a wide range of social media sites. The data is then presented in an easy to digest form showing how many people had positive and negative experience with Compete Club Management. With that information at hand you should be equipped to make an informed buying decision that you won’t regret. What are Compete Club Management pricing details? What integrations are available for Compete Club Management? If you need more information about Compete Club Management or you simply have a question let us know what you need and we’ll forward your request directly to the vendor.